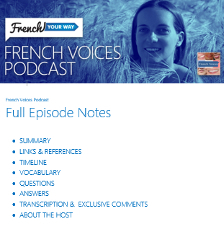 Welcome to French Voices podcast! 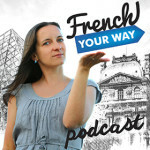 This introduction will run you through who I am and what led me to create French Your Way and French Voices Podcast so you can improve your French in a different, relevant way. I will also give you my recommendations on how to make the best use of this podcast. [03 min 50 sec] Who is French Voices for? 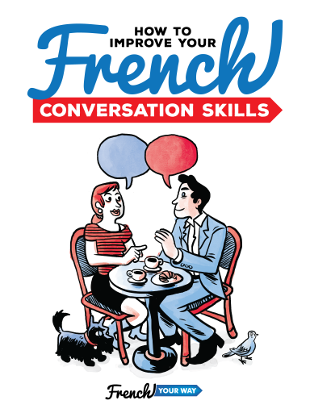 [06 min 50 sec] What you can find on French Your Way website: free articles, cheat sheets, worksheets and more! The following are only suggestions. Feel free to make any change and to share with in the comment section what the most efficient method is for you! Use the transcript to help you while you are listening and focus on the pronunciation and rhythm of the voices. Don’t hesitate to play a same portion multiple times until you feel that your ear “tunes” to the accent you hear. Don’t try to understand everything! See what keywords you recognize or which ones could be a useful addition to your vocabulary. You can use the episode timeline in the show notes as an extra help to follow what is being said. Read the questions related to the first part of the podcast. Play this first part once or twice, taking notes if you need to. Try to answer the questions. You can choose to replay the first part and follow the transcript at the same time if you think you need to. It’s better if you can understand most of the part before moving to the next one (but don’t try to understand everything). Repeat steps 2 to 5 for each part of the interview. Take a break when you get tired!